Brunch is a beautiful thing, isn’t it? Not quite breakfast, not quite lunch, and an excellent excuse to get friends together for an afternoon of relaxed fun. The problem for the host or hostess is often being able to enjoy their own party – so many breakfast foods are best served immediately after they’re made. Think scrambled eggs, pancakes, waffles… so how do you serve a delicious brunch without running around like a chicken with its head cut off? The answer is the make-ahead brunch. All the work happens the day before, so all you need to do the day of your brunch is turn on the oven and look pretty for your guests. Or, if you like, cut up some fruit or make a green salad to add some freshness to the menu! This menu as written serves 6 to 8 adults. 1 lb. of day old bread – something without a heavy crust works best, like challah or leftover dinner rolls. Prepare an 11×17 casserole dish with butter or cooking spray. Set aside. 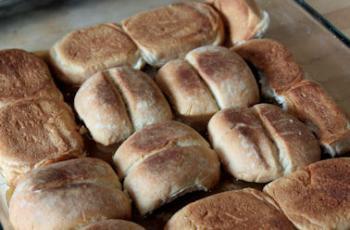 Slice your bread or rolls into pieces about half an inch thick, and set aside. Combine butter, brown sugar, and corn syrup in a small saucepan over medium heat. Heat until bubbling, stirring often. Pour carefully into prepared pan, ensuring that the bottom of the pan is evenly coated with caramel mixture. 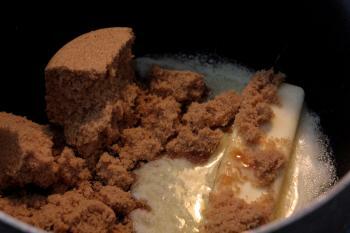 Press bread slices into caramel mixture, filling pan with a layer of bread. Do not overlap bread, but try to cram it as close together as possible. 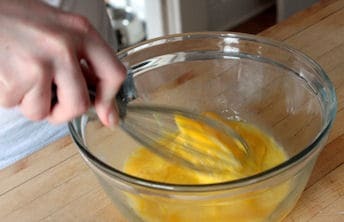 Whisk together eggs, milk, salt, brandy or Grand Marnier if using, and vanilla until well combined. 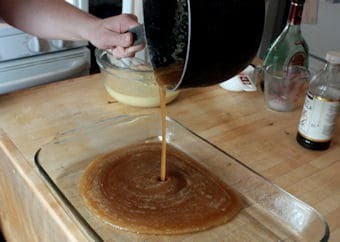 Pour over the bread and caramel in the dish. 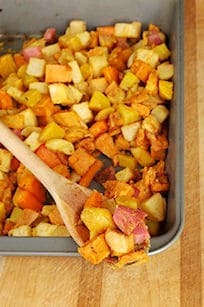 Cover, and refrigerate for at least 8 hours, or overnight. Preheat oven to 350F. While the oven preheats, remove dish from the refrigerator. Bake uncovered for 35 to 40 minutes, or until well browned on top and bubbling around the edges. Serve hot. Combine the flour and salt in a food processor (see Notes) and pulse several times just to mix. Sprinkle the pieces of butter over the mixture and pulse the machine until the butter gives the flour a mealy texture. With the machine running, drizzle in the water through the feed tube, starting with 1/2 cup, then pulse just until the water is incorporated. The dough should be moist enough to form a ball but not be sticky. If the mixture seems dry, add more water, a tablespoon at a time. Divide the pastry in half and press into two flat disks, wrap them separately in plastic, and refrigerate for at least 1 hour before using (see Notes). 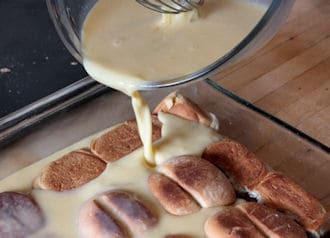 Notes: The pastry can also be made by hand, as follows: Whisk the flour and salt in a large bowl to mix, then cut in the butter, using a pastry blender or two knives, until the mixture resembles coarse meal. Sprinkle 1/2 cup of the water over the mixture and toss with a fork to mix. Use your hands to test a small portion of the dough; it should hold together but not be sticky. Add more water if necessary, a tablespoon at a time. Form, wrap, and refrigerate as directed above. The dough may be refrigerated for 2 to 3 days, and frozen for up to 3 months. Cook bacon in a skillet over medium heat until crispy; drain and set aside. Warm butter and oil in a skillet over medium heat; add onions and a pinch of salt and cook gently until onions are very soft. Set aside. Whisk eggs, milk, nutmeg, and a pinch each of salt and pepper together. Preheat oven to 350F. Prepare two nine-inch pie plates or pans. Roll out pie crust until about 1/8th of an inch thick, and place in the two prepared pans (if using prepared pie crust, just place in the pans). Line with parchment paper, weight, and bake for 15 minutes until lightly browned. Various kitchen and homewares stores sell “pie weights,” or you can do what I do because I am cheap – just use dried beans or rice. Remove the parchment and weights and cool crusts about 20 to 30 minutes, or until they can be handled. Pour 1 cup of egg mixture into the bottom of each pie crust. Place half the bacon and half the onions in each quiche. Top with a quarter of the cheese (per quiche). Top each with half of the remaining egg mixture, and half of the remaining cheese. Bake 30 to 40 minutes, or until the center of the quiches is just set. Cool completely, cover, and refrigerate. The fully baked quiches can also be frozen – remove and defrost completely before the party. Warm quiches until hot, or serve at room temperature. Preheat oven to 350F. Toss potatoes with oil, garlic and spices and arrange on a single layer on a large sheet pan. Roast for 30 minutes, stir, and roast for another 20 to 30 minutes, or until slightly crisp on the outside and cooked through. Timing the day of the party: I would suggest putting the French toast in the oven for about 20 minutes, then adding the potatoes and quiche at that point. 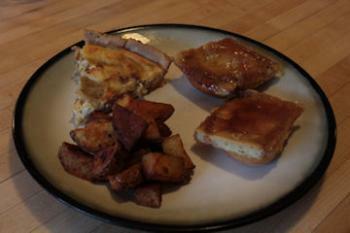 When the French toast is done, it can rest for a few minutes while the potatoes and quiche finish heating. Then you’re ready to go! What are your favorite go-to make-ahead brunch recipes?